A brand new study has grouped available evidence together to show the stress-reducing powers of transcendental meditation. Since it has the capacity to prevent and help treat heart disease, there is a push to consider meditation as a part of health plans. Heart disease kills more adults than all other health problems. It is often labeled as the “silent killer,” as what goes on in your blood vessels can be undetected for decades. But, modern medicine has been researching and incorporating alternative approaches to help treat heart disease and its causes, as well as prevent it in the first place. RECOMMENDED: Meditation could help you deal with pain. One of these alternative techniques is meditation. A new research review paper shows how well meditation reduces stress and helps the heart on many levels. Its authors suggest that there is enough hard evidence now that we could include such alternative therapies in health plans, both private and government-sponsored. For young adults, meditation has been found to reduce blood pressure, improve heart structure and improve behavior in school (among teenagers). It was found to be safe as well, with no evident adverse effects. 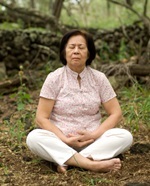 In adults, meditation reduced stress hormones and other physiological measures of stress. It also produced more rapid recovery from stress, decreased blood pressure and use of blood pressure medication, decreased heart pain in angina patients, cleared the arteries, reduced the risk of stroke, improved distance walked in patients with congestive heart failure, and decreased alcohol and tobacco use, anxiety, depression, and medical care usage and expenditures. That is quite the portfolio. Oh, and what else—it lowered risk of death from heart disease, cancer, and all causes. Researchers say the review may be more important than individual studies, because it shows that meditation has a healing effect on all levels of heart disease. Transcendental meditation, in particular, has been shown to produce this array of changes. What if more of us practised it? Would we be better off? Less stressed? More free of disease? Would the nation save money in medical care? Most experts involved say yes, to all of these questions.